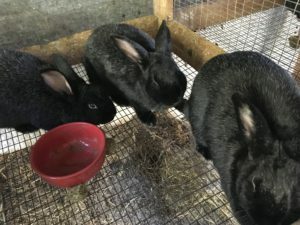 Silver fox rabbits for meat, pelts, and fertilizer. Begin animal husbandry disclaimer and recommendation. Ok, so I was an animal rights activist in college and then was a vegan for eleven years. I started eating meat again when I moved to West Virginia in 2001 and mostly ate venison, lamb, and goat. After reading ‘Eat Right for your Type’ and realizing that my life had pretty much shown me exactly what the prescription for my blood type, B+, was, I decided to somewhat follow the rest of the recommendations. Well, guess what, chicken is an ‘avoid’ and rabbit is a ‘beneficial’. So, here I am farming for 10 years and realizing that most small farms have livestock for sustainability and now eating meat and a friend of ours offers us her entire rabbitry. Presto, we are in the rabbit biz and my dear wife is now the rabbit mommy and doing a bang up job at it, (she is a trained midwife and animal lover) and I am keeping animals in cages(ugh) still doesn’t feel great, but there are ways of making it pretty darn humane, I mean after all, in the wild rabbits live in holes in the ground and fear for their lives and have to feed themselves. 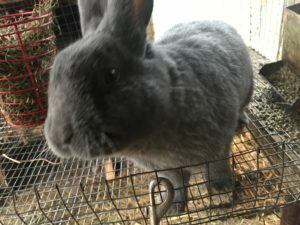 Anywho, long story short, we raise Silver Fox rabbits that are a heritage American breed that have awesome characteristics. 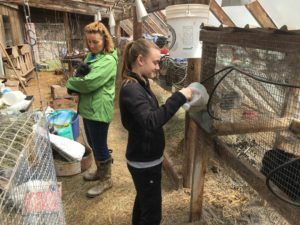 Their poo, or pellets are not a hot manure, are 2-1-1, very conveniently packaged in dry jelly beans of twice digested alfalfa and are a real boon for not spending a ton of money on Espoma Garden Tone. Lo, though, not too many people are hot on eating a ‘fuzzy lil’ bunny’ and we don’t sell a ton of meat, but some people love it and many others remember the slimmer years of America when a cheap protein source for a small farm was a life saver. The French know what’s up! A braised rabbit in a mustard-yogurt sauce is to die for. I am growing tarragon now to try that, can’t wait.